Note: This post was written yesterday as the first thread of thought, which I published in German as a thread on Twitter. I’ve arranged these thoughts for this post once again and added them in summary. The article is based on my first observation while Kati and I were sitting in the Nuage Café yesterday. It’s Sunday, Kati and I are sitting in the Nuage Café in Paris. It’s in the 5th arrondissement, near the Sorbonne. It is run according to the anticafé principle, so we pay for the duration of our presence, but not for consumption. The gastronomic offer is quite similar to that of small cafés. There are coffee specialties, you can make your own bread and snacks. Consumption is included in the price. The coworking space is full, there are hardly any free places on both floors. Most people here are women. There are only a few teams. If a group consists of more than two people, it is purely male. This may seem like a snapshot, but I’ve seen it before, in different coworking spaces. In open spaces, there are often more women, but teams are always more male. New usage patterns: Memberships are not in demand. Classic coworking spaces and new coworking places like anticafés seem to appeal to the same target groups, despite different billing models. However, the flexibility in usage behavior is higher in an Anticafé. The time people spend in the Anticafé is shorter, which is undoubtedly also due to the price model and the lack of memberships. At least that’s how it works here. But not shorter than coworking spaces in very urban centers, for example. In yesterday’s blog post about the community in St. Oberholz that reminds of Schrödinger’s cat, I describe precisely this non-member community that exists exclusively here in the Nuage Café. Probably there are regular guests, but no members. There is also a lack of recreational areas away from the workplaces. The advantage of this coworking concept is the new and larger target group, whose usage behavior fits perfectly with the idea of access borrowed from gastronomy. These people consume time while the members of a coworking space often do not work at weekends. Especially since not only freelancers and startups use coworking spaces, but also permanent employees and teams from corporates. Probably very lucrative in combination with team rooms. 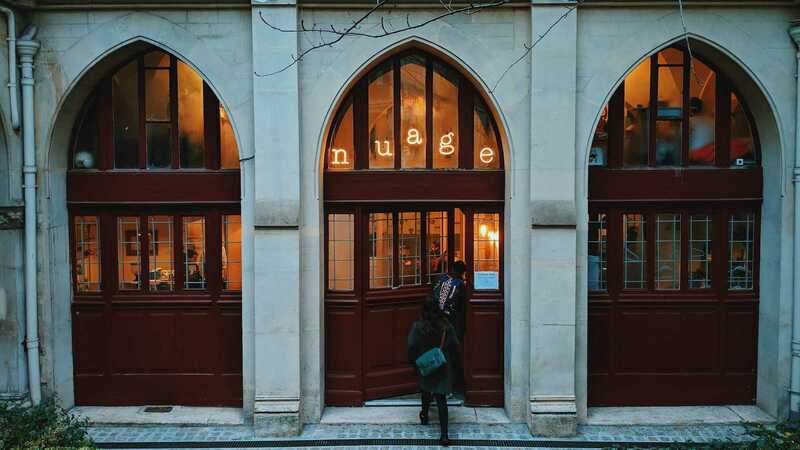 While, unlike cafés, coworking space is never staffed on weekends, anticafé projects like Nuage Café offer it. So they are organized like cafés, where staff also work on weekends, but work as coworking spaces from the supply side. There is no service in the form of community management, but there is that of a café and, above all, there is access. This is even temporary and not 24/7, which makes the concept lucrative. Low administration costs with low personnel costs sound interesting for every operator. I can’t make a reliable statement about the income from anticafé projects. This principle with its advantages in combination with separately accessible team rooms sounds however super. The Anticafé replaces coworking and community management. This does not mean that there will be no more coworking spaces with classic member communities. However, I believe that these access concepts will be available on more and more areas with a lot of public traffic. Service will be outsourced to the Anticafé, which will then be integrated into lobbies and other open spaces. This will expand the coworking idea into new areas.